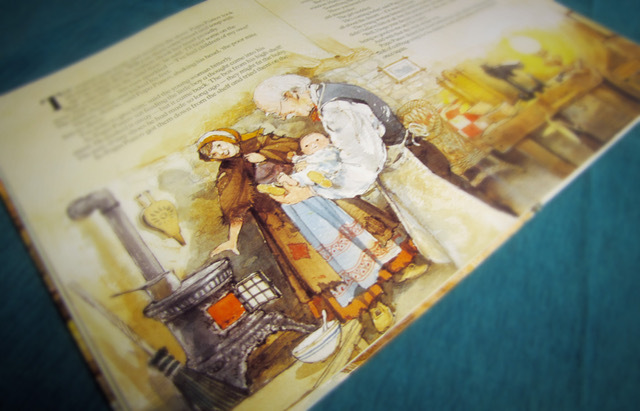 Enjoy this review by Lynn Custer of a little-known Christmas book. Meet Papa Panov, the not so very rich, yet not so very poor, old shoemaker. He lives in a quaint Russian village, and he is happy…. most of the time. Most of the time he is perfectly content to live day in and day out serving people who always need new shoes. He sings and whistles while he works. He says a cheery hello to every passerby. But on one particular day… one special day… he was sad. It is Christmas Eve and Papa Panov finds himself gazing out of his window missing his late wife and his children that have all grown up and gone away. He is lonely. So, he decides to dust off an old brown book that he hasn’t read in quite a while. He lets his fingers run across the pages until he comes to a story… the Christmas story. He begins to read. He reads of the Christ-child, the King of Kings, not born into a palace, but a lowly stable. As he reads he imagines the bed of hay, the messy stable, and he thinks to himself how he would welcome Jesus into his home and all the ways he would extend his hospitality. He could offer his own bed or maybe his warmest quilt? He reads on to wise men, travelling a great distance, to bring gifts for the Savior. He thinks of what he would like to give, should the infant King come to visit him. Perhaps his very best pair of tiny shoes? Then, with a wish in the air for the Savior to come to him, he falls asleep. When Papa Panov awakes, it is to a voice calling him, telling him that He will come. He tells Papa to watch for him from dawn until dusk. “Be sure you recognize me, for I shall not say who I am.” Papa Panov realizes that it is Jesus speaking to him, telling him that He will visit on Christmas Day. But how will Papa know this Man who is God? What follows in this heartwarming story is a series of unexpected visitors on that very special Christmas day. As he watches out of his window for Jesus to come, Papa quickly spies a roadsweeper here and a young mother there – both of which could use the warmth of his fireside and a nice hot cup of coffee. He offers his company, his kind smile, and even his best pair of tiny shoes for a baby’s cold bare feet. Then, after a day of people bustling busily by his window and with each of his visitors gone and on their way, he sits down to his evening meal all alone. Did Jesus come and he missed Him altogether? Maybe He passed by the window and Papa didn’t recognize Him. Or was it all imagined or some dream he had dreamed? Tears fill his eyes as these thoughts swirl in his mind. Where will you see Jesus this Christmas season? Where will you look for Him? It may just be that He is that old man that comes to church and sits alone on the back row every Sunday. Or the old woman you see standing outside of Wal-Mart every week that looks cold and hungry. Maybe Jesus is in the soup-kitchen downtown, or maybe He is in a small bed upstairs wondering, waiting for some special, and much needed, one-on-one quiet cuddle time with mom or dad. 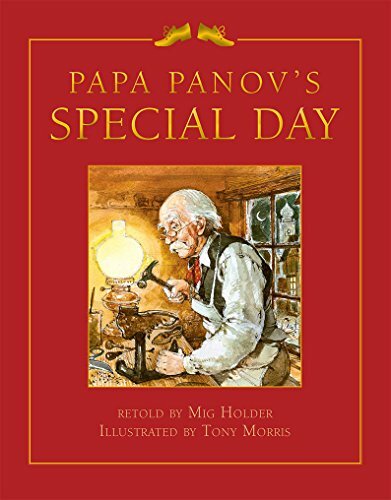 The story of Papa Panov, written by the renowned Russian author Leo Tolstoy, is a story that will encourage parents and children to look for Jesus in the faces of those around them. The faces may be dirty or they may be clean, but no matter. Just as Papa Panov finds joy in serving those in need right outside his door, so can we find the same joy just by looking around us and reaching out to others.